Have you been following the "work in progress" portrait on my facebook page last week? It has been such fun painting and sharing the process with readers at the same time. A challenge for sure, but very exciting... On Facebook I only shared the portrait part of the painting. I've been working on the background some more and it's finally done! So today I'd like to share the whole painting with you: it's called Gentle Heart. Below you'll find slide-show and a recap of all the different steps from start to finish, including techniques. And as always, I look forward to reading your comments and answering any questions you may have, technical or otherwise. Enjoy! First, a peek at my portrait toolkit! Step 1: I start with lightly sketching the main features with a pencil, then add a light wash of white acrylic paint to the "skin" areas. TIP: if you're not comfortable drawing, take a photo you like and print it the size you want the portrait to be. Roughly cover the back of the paper with a 2B or 3B pencil, then place it on your canvas (image facing you) and trace the features with your pencil on the photo: they will transfer to the canvas. Step 2: Roughly shading with "walnut stain" Distress ink, using my fingers. Step 3: Awakening her soul right from the start... Watersoluble black Stabilo All pencil + matte gel medium on a super fine brush. Step 5: Shading some more and adding color to the lips with Pitt Artist pens (B, brush tip) #189 & #169. These are India ink pens. I add tiny touches of color, then move it around with a super fine, wet brush. And highlighting some areas with a white Posca paint pen and a paintbrush. At this stage the nose is way too round for my taste! 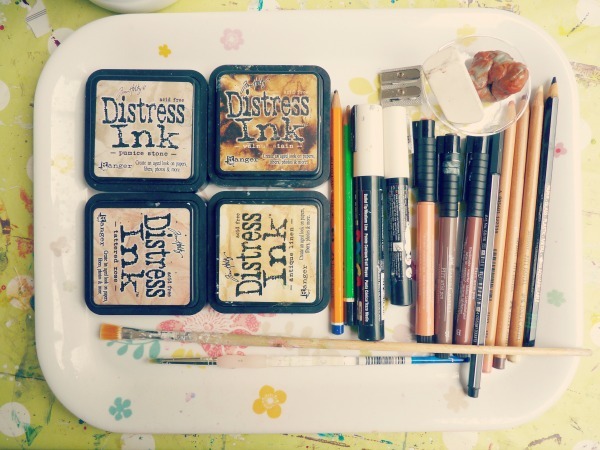 NB: Distress inks are water-soluble, which means that you should work with a dry brush or finger. BUT you can also use this to your advantage to create different effects. For instance if you want to add more definition to the eyebrow, you can add just a little bit of water or gel medium to your brush: you'll get a watercolour effect + variation in the color of the ink (walnut stain becomes more yellowish). TIP: To safely remove layers of paint I use hydroalcoholic gel on a cotton bud. As promised, here is the video showing you the whole portrait coming to life, from start to finish! I hope that you enjoyed this process and that it will inspire you to try your own mixed media portrait... Remember to let go of any expectations regarding how the face is "supposed" to look. Let it unfold and bloom naturally, and once you get a glimpse of the soul behind it, take your time, let it sit aside for a while if you need to, don't rush it. But also know that "mistakes" are part of the process and that, like all our experiences in life, they shape who we become and allow us to learn and grow. They will eventually give your portrait its own unique character once it is fully born on your canvas. And of course you can ask me any questions here in the comments or on Facebook. My very first large painting!